In response to the synthetic drug use epidemic in Oklahoma, Narconon Arrowhead offers new information and solutions for prevention and rehabilitation. Narconon Arrowhead, an effective drug and alcohol rehabilitation program located in Oklahoma, is issuing a warning to all parents about the dangers of synthetic drugs and especially K2. The Bureau of Narcotics in Oklahoma has called the synthetic drug issue a major epidemic in the state of Oklahoma. According to a press release from the Oklahoma State Senate, “Synthetic drugs have been responsible for numerous deaths and hospitalizations across the country in recent years.” K2 has been said to be the main source of the problem with drug makers coming up with more than 150 concoctions of the substance trying to escape chemical bans from the state. Synthetic drugs are psychoactive substances made from a variety of chemicals and are often sold in gas stations or convenience stores across OK. Very often K2 is made with herbs and spices and sprayed with a synthetic THC mixture causing hallucinations, paranoia, anxiety, confusion, panic attacks and psychotic episodes in users. In July of 2014 a new law was passed to stem the epidemic with synthetic marijuana in the state after a high profile murder occurred where a young girl lost her life to someone who was under the influence of K2. Bill 2666 was to take effect this November to get the drug out of Oklahoma for good. A news story from KOCO in Oklahoma City says the Bill works in a way that, ‘If a chemist can testify that a chemical can be used to make the drug it can be outlawed without having to ban the specific drug.’ After a similar law was passed in Arkansas, state officials in Oklahoma implemented it. Currently, 142 chemicals are connected with the making of the drug are banned in Oklahoma. According to state officials, September of 2008 was when the state first starting seeing synthetic drugs use amongst young people in Oklahoma. Narconon Arrowhead, an effective drug and alcohol rehabilitation program located in Oklahoma, is issuing a warning to all parents about the dangers of synthetic drugs and especially K2. This month, Narconon will be putting new information on their main website at http://www.narcononarrowhead.org about the most commonly abused synthetics, taking a close look at synthetic marijuana and its effects and providing tips for spotting and treating synthetic drug use with loved ones. The facility states that if you notice symptoms like those mentioned above in a friend or family member or see synthetic drug paraphilia like packages with names like “Black Mr. Devil,” pipes, rolling papers, etc. to seek immediate help. Admissions personnel are available through the Narconon Arrowhead helpline 7 days per week by calling 800-468-6933. 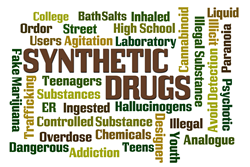 Synthetic drug abuse like any drug abuse is a serious and potentially life threatening matter. If you suspect a loved one or friend is abusing drugs or alcohol call the Narconon Arrowhead helpline now at 800-468-6933. Counselors are available to help you. For more information visit the facility website or call today.